Dibbles and Dabs | Celebrating a passion for cooking by sharing recipes, current food trends, and more. 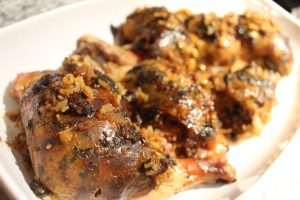 I am an avid collector/cook of ethnic recipes so I was very happy to stumble across Goodcookbecky’s blog, featuring a great variety of ethnic recipes and, in particular, a collection of German recipes…. Yum! 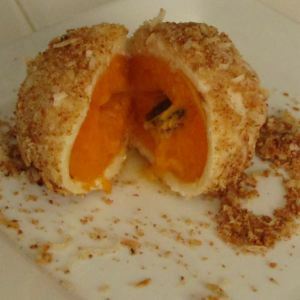 The particular recipe that caught my eye are these delicious Austrian/Apricot Dumplings aka Marillenknodel (German for Apricot Dumplings) which are nothing more than glorious, fresh apricots lovingly wrapped with a cream cheese dough, cooked in simmering water, and then rolled in toasted breadcrumbs and coconut! With a summer bounty of fruit this makes a delicious recipe to add to your repertoire and one which could easily be made with other fruit , such as plums, apples, etc. I am a true lover of fruit-based desserts and I know this is one that I will frequently be making! Thanks Goodcookbecky for a great recipe! 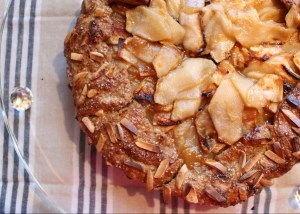 How beautiful is this Almond Crusted Apple Galette with Salted Caramel Drizzle from Sisters Who Dish. 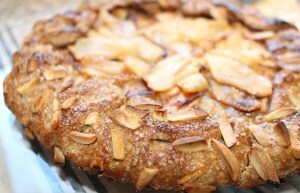 I have always loved the rustic appeal of a galette and this one has all of the flavors I love. If you’re looking for an easy dessert, that doesn’t require lots of patience or precision–look no further! 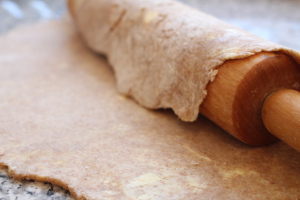 You can make a galette with any fruit that you have on hand–frozen or fresh. I’ve made galettes with peaches alone, peaches and blackberries, but apple always seems the ‘coziest.’ It’s the perfect end-of-the meal dessert, but also great for brunch or breakfast; and especially delicious a la mode [with a large scoop of ice cream]. Note: Based on the fruit you choose for the filly, you may have to alter the amount of sugar (i.e. peaches need more sugar than do apples). What to do with a can of blacks beans and some fresh pineapple? Why, make a southwestern inspired meal beginning with a delicious black bean and pineapple salad! This salad complements beautifully with the rest of my southwestern inspired meal which consists of my previously posted southwestern dry-rubbed grilled pork chops (nice and thick and juicy, of course) and mashed turnips with green chiles and goat cheese. Absolutely delicious, and a meal I repeat often! In a medium bowl mix together the black beans, pineapple, tomato, red onion, jalapeno pepper, and cilantro. Set aside while preparing the cumin-lime vinaigrette. *Note: When I use raw red onion I prefer to soak the onion in cold water for a few minutes (changing the water a couple of times) and then blotting them dry with a paper towel or a clean dish cloth. I find that this helps mute their strong taste which can sometimes overpower other ingredients in the dish. In a small bowl mix together the lime juice, honey, dijon mustard, sherry vinegar, cumin, and black pepper until well blended. Slowly drizzle in the canola oil…whisking briskly until thoroughly combined. Add the vinaigrette to the prepared black bean and fresh pineapple salad, stirring gently until combined. Refrigerate for at least one hour to allow the flavors to blend and the salad to chill. Total Servings – 8 (approximately 1/2 cup per serving). Per Serving – 110 calories, 20 g carbohydrates, 15 g fat (only 1 g saturated), and 5 g protein. This salad is very nutritious – low in calories, carbohydrates, and saturated fat, while being high in protein and a wide variety of vitamins and minerals. Definitely a heart-healthy choice! I hope you enjoy this southwestern inspired salad as much as I do… and do have the southwestern dry-rubbed pork chops to go with it. Until next time my friends, be blessed in all you do and may the Gods of Good Food and Cooking smile down upon you! Spring is in the air! This just always makes me want to be outside, basking in the warmth of the sun’s rays, feeling the renewal of spirit and rejuvenation that Spring always brings. And with that comes the burning desire to break out the grill, polish it to gleaming perfection, throw in the coals, light the fire, and throw on the ???? This is where it gets a little tricky. There are always so many things I want to make, but today thick, juicy pork chops are calling my name. What isn’t there to love about smoky, perfectly grilled and seasoned pork chops…especially when grilled to perfection. Definitely my idea of heaven, yum! Emeril Lagasse is right, pork fat rules! The secret to these tasty chops is my southwestern style dry rub seasoning. It adds the perfect blend of spicy, sweet and smoky. This is by far one of my favorite go to spice rubs and works equally well on burgers, chicken, and ribs. Rinse and pat the pork chops dry. Rub each chop with 1 tsp olive oil. Mix remaining dry seasonings together and apply equally to the pork chops – vigorously patting each chop so that the seasoning adheres well. Place the chops in a ziplock bag and refrigerate for at least 4 hours (preferably overnight). Preheat your gas grill on high for 10 minutes (if you are using charcoal build up your coals on one side for a high heat for searing and the other side with less coals for a cooler side to finish them off). Place the chops on the grill and close the lid. Allow to sear for 1-2 minutes. 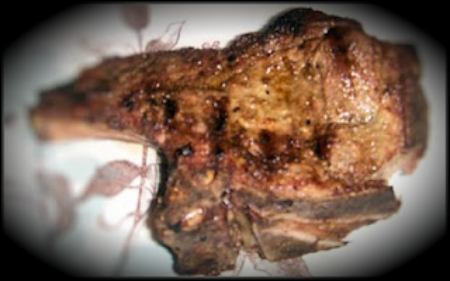 Flips the chops, close the lid and sear again for another 1-2 minutes, aiming for a nice charred chop with grill marks. Lower the heat on your grill to medium (or is using a charcoal grill, move the chops to the cooler side of your grill). Rotate the chops to get cross hatch marks and let cook for another 3 minutes with the lid down. Flip the chops over and continue cooking for approximately 4 more minutes or until the chops have an internal temperature of 155 degrees F.
Remove the chops from the grill, cover loosely with foil and allow to rest for 5 to 10 minutes. This will raise the final temperature to 160 deg F. and allow the chops to accumulate those awesome juices. Green Chile & Goat Cheese Smashed Turnips! Yum! These chops pair wonderfully with my black bean and fresh pineapple salad (recipe coming soon) and green chili and goat cheese smashed turnips or sweet potatoes… simply boil or grill 4 large turnips or sweet potatoes, add 1 small can green chilies, 3 Tbs butter, 3 Tbs. milk, and 2 oz. goat cheese, salt and pepper to taste. Roughly smash and serve. Delicious! Today I found myself watching an amazing 2014 documentary, hosted by Forest Whittaker, titled Food Chains. This insightful documentary centers around Immokalee, Florida, known as the tomato capital of America, and depicts the horrible conditions that tomato farm workers, and farm workers in general, have been forced to endure in the past decades. Human rights violations are particularly high for farm workers due to little or no government legislation, as well as a fear of reporting by the abused farm workers themselves. The video shows an in-depth examination of the atrocious treatment (human slavery, sexual harassment, low wages, long term exposure to pesticides, etc) of farm workers throughout the country, with a particular focus on Immokalee and the steps that a small group of tomato farm workers took to take a stand against these deplorable conditions. One such story focuses on a slavery ring discovered in Immokalee, Florida in 2007. Farm workers seeking employment were giving farm jobs and housing and charged exorbitant rates. These high rates led to the workers incurring debt to the two brothers that had established the ring. These debt-incurred workers were then treated as slaves with wages being stripped away and nights spent chained in the back of a u-haul truck. One such worker, after spending a year in the back of this truck, noticed a hole in the roof and managed to break free of his chains and escape out the hole. This is not an isolated story. This slave ring eventually became a case before the justice department and brought national attention to the deplorable conditions that farm workers are being faced with. This national attention has recently led to an interest by some senate members, although to date, no official legislation has been formally passed to protect farm worker’s human rights. To date, slavery, and particularly, sexual harassment are still rampant. The Food Chains documentary goes on to detail the formation of CIW (Coalition of Immokalee Workers). Tired of the unfair and cruel treatment and very low wages, a few of these tomato farmers formed CIW in the 1990’s and have gone on to become a huge success in the advancement of human rights and fair wages for farm workers through myriads of hunger strikes and tireless activism, as well as the establishment of the Fair Food Program and a Code of Conduct (designed to place the responsibility of providing better working conditions and wages on the food corporations that are buying the Immokalee produced tomatoes (Publix, Wendy’s, Walmart, Taco Bell, et.al.). The Fair Food Program asks large retailers like supermarkets and fast food restaurants to pay just a penny more per pound of tomatoes and to refuse to buy tomatoes from farms with human rights violations. Their model has been touted as one of the better working models to date and has gained international recognition. On March 21, 2015, CIW held the largest fair food march and concert in recent years and is making great inroads in eradicating terrible working conditions and poverty for the many farm workers in America, but it certainly has not been easy. They have faced great resistance from the corporations they seek support from, particularly Publix and Wendy’s, who have flat out refused to even enter into discussions with the CIW in the advancement of better wages and working conditions for these farm workers. They have stated that they are not responsible for the welfare of the farm workers, that it is the responsibility of the farm suppliers who employ the workers. Yet these corporate food giants are so very wrong in promoting these statements. Since they control these food supply chains shouldn’t they be instrumental in providing fair and equitable working conditions and wages to the farm workers who supply them? 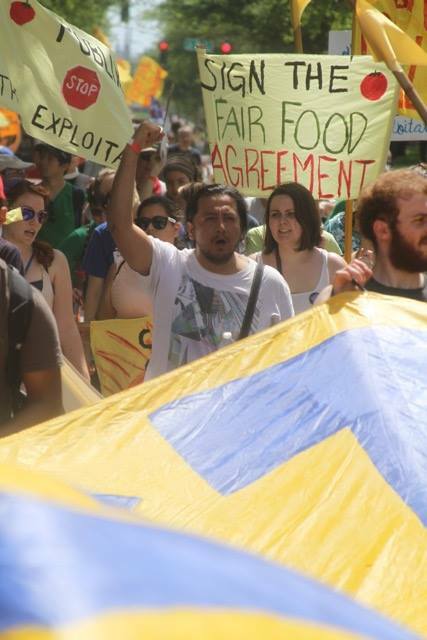 The Fair Food Program emerged from the Coalition of Immokalee Workers’ (CIW) successful Campaign for Fair Food, a campaign to affirm the human rights of tomato workers and improve the conditions under which they labor. The work of the FFSC today is producing a replicable, scalable model for expansion of the Fair Food Program beyond the Florida tomato industry in the years ahead. The high degree of consolidation in the food industry today means that multi-billion dollar brands on the retail end of the industry are able to leverage their volume purchasing power to demand ever-lower prices, which has resulted in downward pressure on farmworker wages. The Fair Food Program reverses that process, enlisting the resources of participating retail food giants to improve farmworker wages and harnessing their demand to reward growers who respect their workers’ rights. The Fair Food Program provides an opportunity for those corporations to bring their own considerable resources to the table – their funds and market influence – to help forge a structural, sustainable solution to a human rights crisis that has persisted on U.S. soil for far too long. In the process, the Fair Food Program will help build the foundation for a stronger Florida tomato industry that can differentiate its product in produce aisles and restaurants on the basis of a credible claim to social responsibility and so better weather the challenges of an increasingly competitive marketplace. Ongoing auditing of the farms by the Fair Food Standards Council to insure compliance with each element of the program. Together, we can make a difference and help eradicate the horrible working conditions and poor wages that these hardworking farmers are subjected to. One way you can show your support is by signing this Fair Food petition. For those of you who would like to take even further action in support of this cause, you may be interested in starting a campaign in your area. Learn more here. 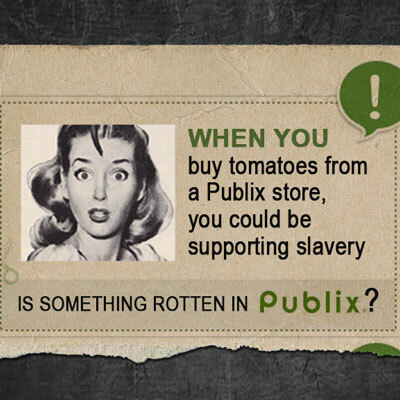 And lastly, take the time to petition Publix and Wendy’s to join this fair and equitable program and ensure our tomatoes meet the highest human rights standards in the food industry today. I would love to hear your thoughts and comments. 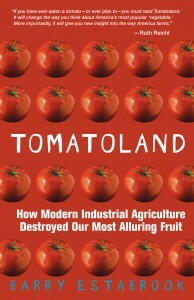 For those of you who have not yet had the opportunity to watch Food Chains or read Tomatoland, I urge you to put them on your to-do list. They are truly eye-opening experiences of our current agricultural and food-supply chain practices. Welcome back, everyone. I hope you had a joyous and blessed Easter with a chance to reconnect with friends and family. Holidays truly bring out the warmth and love in people with an open generosity of spirit. 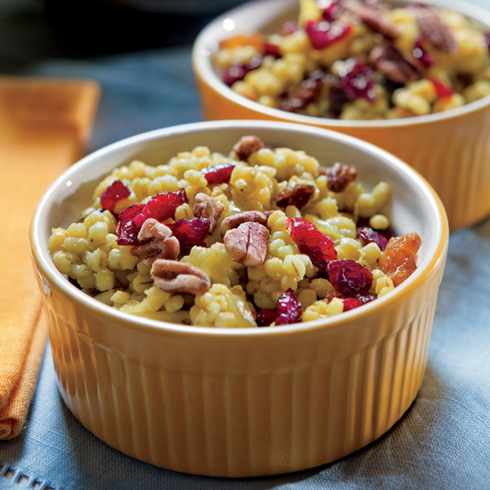 And for us Foodies, we have the added benefit of being able to load up our holiday tables with our favorite recipes! I am the one who usually does most of the meal preparation during holidays, but this year I fell ill with a bad cold. The kind that went right to my chest. Yuk! Needless to say, I wasn’t up to spending hours in the kitchen, to say nothing of spreading a bunch of germs. Thankfully, my dear sweet daughter came to my rescue and pulled together a delightful and tasty meal. Not being one to enjoy being idle, or sick for that matter, I decided to take the time and scour the world wide web looking for some great leftover recipe ideas for using up our holiday ham. For those of you who also made ham, I think you will be inspired by the recipes I am sharing with you below. I know they certainly gave me a ton of ideas and I can’t wait to give them a taste. All of these recipes look and sound so delicious. I hope you enjoy making them as much as I have posting them for you. I would love to hear which recipe(s) you chose to make and how well they turned out for you. Until next time, may your hearth and home be filled with warmth and love. I have to confess, I am a fish-o-holic! I love it and I could (and often do) eat it every day. I know not everyone shares my passion for fish, but for those of you that do, I have a delicious recipe to share with you today. And for those of you that think you don’t like fish, I urge you to give this a try – you may be surprised and find yourself in a never-ending love affair. It is quick and easy – great for busy weeknights when you want to put a delicious and healthy meal on the table. 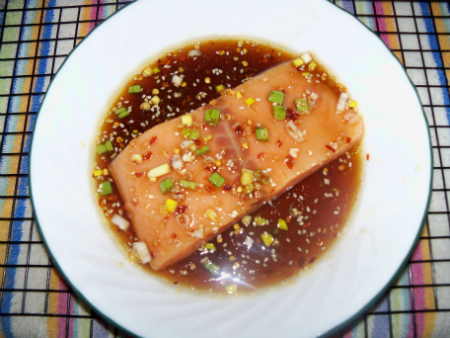 The star of this show is my Asian honey marinade and I use if for more than just my fish. Not only is it great on fish, it is also a great marinade for roasted veggies and even as a dressing for salad! It is truly one of my great work horses and I use it often. I always have a batch ready to go at all times. The recipe I am sharing with you today features salmon glazed with my delicious marinade. For this particular recipe, I have chosen to wrap the salmon in foil before baking since the end result is a tender, flaky and juicy piece of fish… steamed to perfection in its marinade bath. None of that dried out, tough-as-shoe-leather piece of fish here! And as I said before, it is quick and easy and ever so delicious. In a small bowl combine all ingredients through to the salmon and whisk vigorously until blended. (To make things even easier – grab a small empty glass jar, add all the ingredients, and shake, shake, shake – you now have it all set and ready to go – just pop in the fridge and bring it out when you are ready to use it). Transfer the marinade and the salmon to a bowl or zip-lock bag and allow the fish to marinade for 30 minutes, turning the fish one or twice. Pre-heat the oven to 400 deg. and create four (4) individual foil “boats” to place the salmon in, making sure to have large enough pieces of foil to completely cover the salmon (and the roast veggies if you are also preparing them). Place each of these packets onto a large, heavy-duty cookie sheet and remove each piece of salmon from the marinade and place onto the foil. Drizzle each piece equally with the remaining marinade. Place in the pre-heated oven and bake for 25 minutes or until fish is tender and flakes easily with a fork. 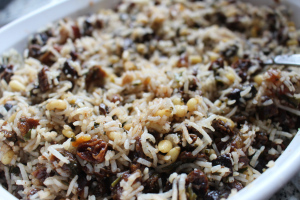 Serve with roasted veggies and rice or couscous for a delicious meal. As you can see in the photograph above, I also roasted some carrots to go along with the salmon. And, yes, I used the same marinade for the veggies as I did for the salmon. I told you this marinade is versatile! If you wish to also roast some veggies, simply double the marinade and choose your favorite veggies – carrots, parsnips, tomatoes, broccoli, and squash are all great choices. Simply rub your choice of veggies with the marinade and place on a foil lined baking sheet and bake in a 425 deg . oven approximately 25 minutes – until just tender and browned, stirring and flipping the veggies once during the roasting. 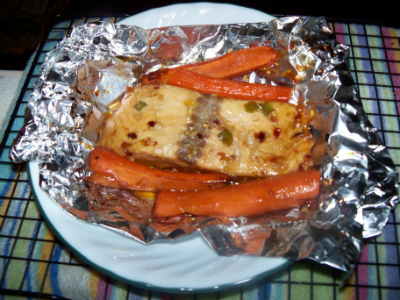 Remove from the baking sheet and place into the foil packets along with the salmon. Enclose the packets and bake as directed above for the salmon. This is truly one of my favorite meals and I hope you enjoy it as much as I do. And if you aren’t that crazy for the taste of salmon, you can easily substitute your favorite firm-fleshed fish. One of my very favorite sandwiches is the Reuben. 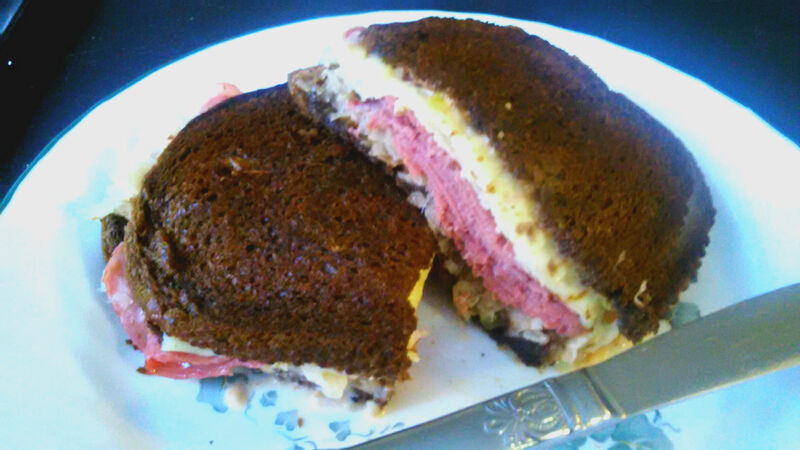 There is just something about the combination of all those wonderful ingredients: corned beef, melty swiss cheese, sauerkraut, thousand islands dressing – all lovingly nestled between two buttery and toasty pieces of bread. Very yummylicious! So today I found myself in the mood for this glorious epicurean delight and what with the recent celebration of St. Patrick’s Day, I thought it a fitting sandwich to share with you. Many of you may still have corned beef and sauerkraut on hand. If not, a quick trip to the market is wholeheartedly encouraged. In the making of these sandwiches, I proudly confess that I never buy Thousand Islands Dressing. It is so easy to make and requires little more than your regular staple items: mayonnaise, ketchup and sweet pickle relish. 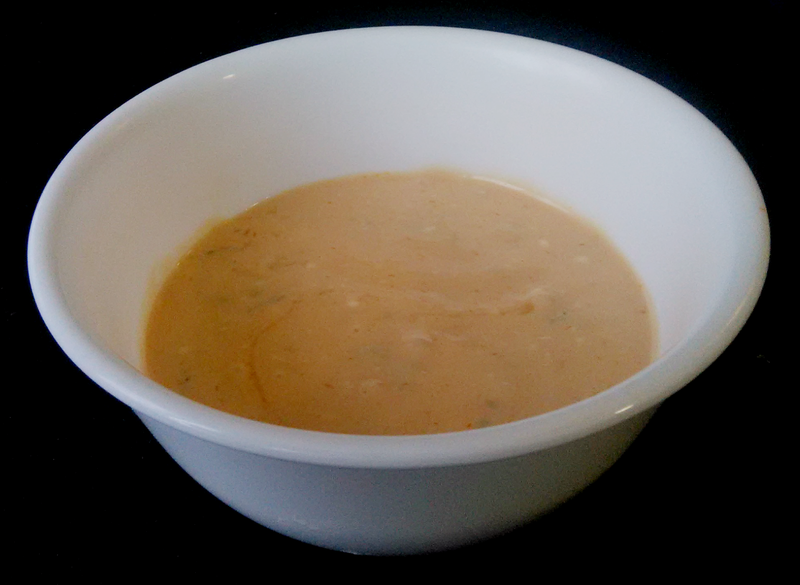 Yep, believe it or not, just by mixing these three items together you will have a great tasting Thousand Islands Dressing. However, for my homemade version that I am sharing with you here today, I am also adding cider vinegar, lemon juice, and sugar… just to kick it up a notch! If you don’t have cider vinegar you may certainly substitute plain vinegar. If you don’t have lemon juice, no problem, just don’t include it.! This truly is a versatile little workhorse of dressings and plays a starring role in what makes the Reuben such a tasty sandwich. In a small mixing bowl, combine all ingredients. Stir well to blend. Set aside while preparing sandwiches. Create sandwich by spreading Thousand Islands Dressing on one of the slices of bread. Upon the dressing, layer the corned beef, swiss cheese, and sauerkraut. Cover with remaining slice of bread and set aside while preparing the pan. Place butter or oil in a cast iron skillet or frying pan and heat to medium, allowing butter or oil to heat through. Place sandwich in pan, press down with spatula, and toast until golden brown on the underside (about 2 minutes). Turn over with spatula and repeat with remaining side, toasting until golden and the cheese has melted. Remove from heat and serve. *Note – Personally, I like to gently heat the sauerkraut in a small saucepan ahead of time to ensure that it is nice and warm in my grilled sandwich, but this is entirely optional. As always, thanks for stopping by. For those of you who may have never tried this sandwich before, do give it a try… it is delicious. And for those of you who, like myself, consider this a personal favorite, be sure to treat yourself to this delicious and satisfying sandwich. May your plates be abundant and your house filled with love and happiness!